Electra was born in Manhattan to an ex-Vogue-model mother of Russo/Polish origins and a surgeon father: the last of 5 children. Soon after flying from New York to London she found herself singing a demo in the same studio where the Beatles had recorded, and in June 1980 put an ad in Melody Maker ‘Vocalist seeks Rock Band’. Her ad featured next to one from the band seeking a ‘Vocalist/Frontman’ – so after a few phone calls, auditions took place and Electra joined Twelfth Night. 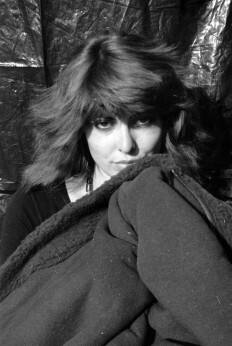 She added vocals to some existing instrumental songs (Cunning Man, Abacus and Keep The Aspidistra Flying) and these were subsequently recorded in Bournemouth in Aug 1980 and issued along with the instrumental Afghan Red on what subsequently became known as the Early Material (or Electra) Tape in Oct 1980. Electra performed around 22 gigs with Twelfth Night between August and November 1980. She remains in the music business and now performs as Electra Cliffton Smith, dividing her time between San Francisco and Edinburgh. In 2009 she released an album called Whatever.